Avengers: Infinity War is a hulking beast of a film with enough moving parts to leave even the most seasoned comic book fan reeling with a sense of overwhelming excitement. Granted, with three Marvel movies slated for release between now and Infinity War‘s arrival – namely Spider-Man: Homecoming, Thor: Ragnarok, and Black Panther – it’ll be some time yet before the studio begins to devote its marketing machine to Joe and Anthony Russo’s ensemble flick, but for the time being, we can always rely on leaked photos and videos finding their way online from the film’s set. 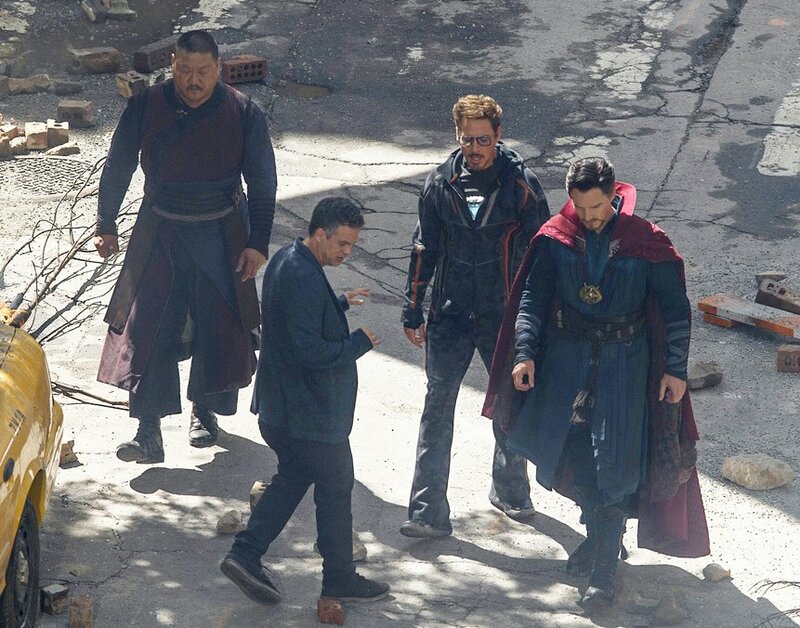 The latest batch comes to us fresh from Infinity War‘s production in Atlanta, Georgia (via Instagram and AP), where Benedict Cumberbatch (Doctor Strange), Mark Ruffalo (Hulk/Bruce Banner), Wong (Wong), and Robert Downey Jr.’s Tony Stark/Iron Man can be seen in between takes. Fed and watered after their lunch break, the Marvel foursome walk the ravaged streets of Atlanta, which is likely doubling for an entirely different location that won’t be unveiled until the movie opens in May of next year. Either way, there are still some story clues that can be gleaned from the photos (and video!) embedded above and below. 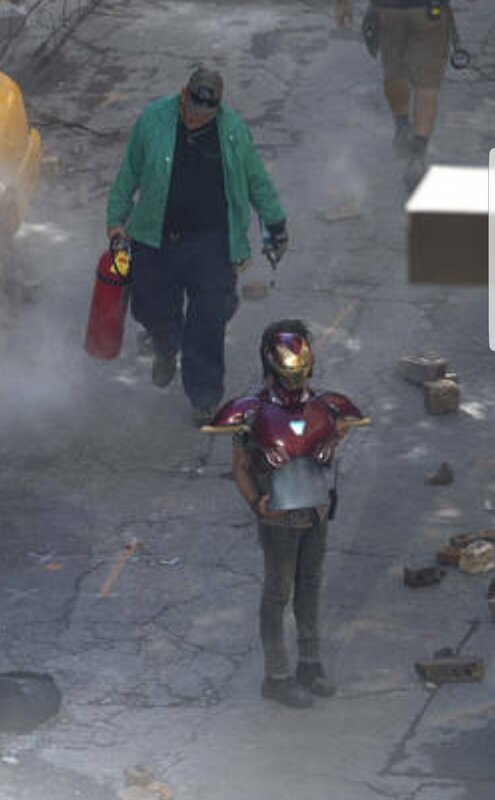 For one, a prop of RDJ’s Iron Man suit can be seen in one shot, which is no doubt a reference point for the film’s VFX team. Pay close attention to the design of the chest and its arc reactor, as its inclusion will fuel rumors that Tony Stark is forced to reinstall the chest piece as a way to offset a near-death experience. 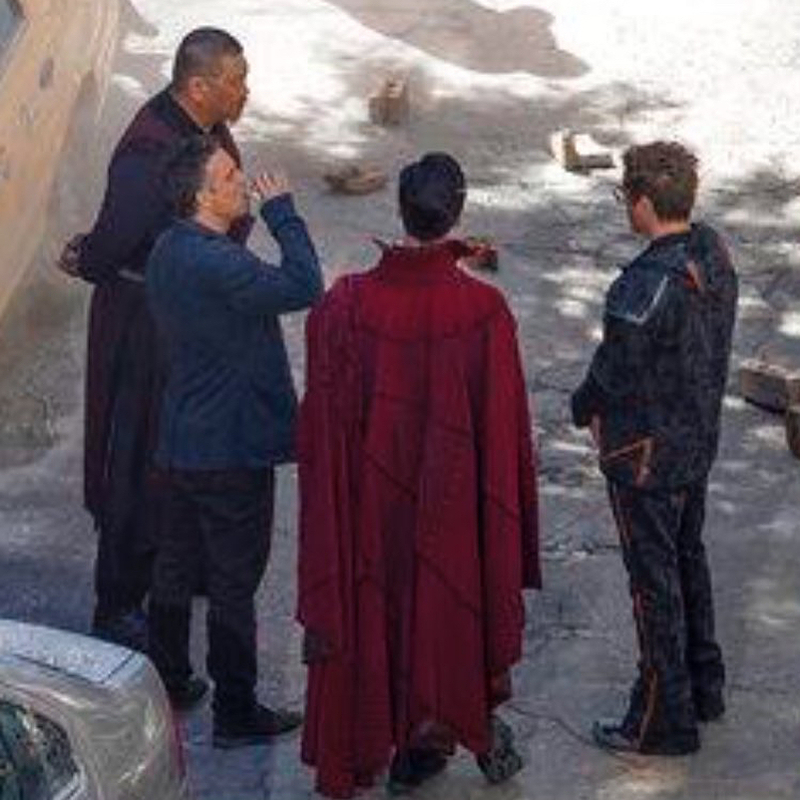 Downey Jr., meanwhile, is decked out in a motion-capture suit, and appears to be confronting an off-screen baddie with the Sorcerer Supreme by his side. The Hulk, perhaps? It’ll apparently be unlike anything we’ve seen before from Marvel Studios – not only because it stands as the culmination of the MCU thus far, but also due to the film’s sheer sense of scale – and we’ll be able to see what all the fuss is about once Avengers: Infinity War hits theatres on May 4th, 2018. It’ll be followed in quick succession by the as-yet-untitled Avengers 4, which is a Marvel blockbuster that will seemingly herald news of the studio’s Phase 4, beginning with Spider-Man: Homecoming 2 on July 5th, 2019.